I am what you would call an overly organized individual. :) I practically survive on labels, post-its, and plastic containers. Everything has its place, and every process has a routine. I wanted to share with you how I handle absent work, missing work, and assignments. This is a picture of the "nucleus" of my assignment management. (Gotta love a science reference). My students turn in work to their designated tray (more about that here). This is seriously one of the best methods for assignment management that I've ever seen (thanks to one of my teammates for the idea)! It is so easy to see if a student is missing something right away. However, that doesn't always happen...so my assignment monitors use checklists every afternoon when they stack the assignments for me. In the pink bin on the top of the turn in trays, there are checklists where my monitors mark every student who is missing that assignment. (Download the template here for free)! My assignment monitors also record the missing assignments on our missing work clipboard. The clipboard is for students to monitor their missing work, while the checklists are for me. They also check for homework every Friday and mark off who turned in their work on our Homework Club clipboard. Students who do not turn in their weekly homework also have it marked in the pink binder on top of my turn in trays. I also store my absent student papers here. I created a new form this year called, "The Scoop on What You Missed." Download the form here for free. So there you have it! Those systems help my classroom run smoothly! What kinds of methods do you use to handle missing work/student papers? I HATE lunch count. There. I said it. I hate the waiting, the reminding, everything about it. Maybe it's because I came from middle school, the land of no lunch count. Whatever the case may be, taking lunch count ranks low on my favorites list. I used hot glue to secure the plates to the ribbon, and then used tacks to secure the entire thing even more to the bulletin board. The clothespins at the top are numbered, and students can simply move their clothespin to indicate their choice! Voila! I'm excited about this new method. I love how little space it takes up. Plus, if the plates get damaged, they are easy to replace! It's no secret that I'm a huge fan of Class Dojo. I even shared how I used Class Dojo for my House Cup Tournament here on my old blog. (I used it again this year by the way too). When I started teaching 5th grade, I noticed that Class Dojo could be used for more than just my House Cup points. My students liked tracking their individual progress too, and I started using individual student accounts during 2nd quarter to help gear up for my tournament. Next year, I'm amping up Class Dojo even more, by using it for student rewards and class rewards. No more compliment jar/paper clip chain/puzzle piece at the end of the day for me! I love the idea of using Class Dojo for individual student behavior but also incorporating the "think win-win" idea that we will use this tool for our class goal as well! Do you use Class Dojo for whole class behavior management? Why It Didn't Work: I think it was too hard for my students to remember to move their clothespin each Friday. They were already so focused on making their lunch choice, turning in their morning work and homework for the week, getting started, etc. It became a game each Friday of me reading of the numbers on the clothespins to see who forgot rather than looking at the clothespins quickly to assess who did not turn in their work. Why it Worked: These turn in trays were fantastic. I could easily look and see who had not turned something in, and for many of my kids this was a fast reminder to get their work in. Sure, it takes up some space, but it is totally worth it. Plus, it makes it super easy to collect work in ABC order! Why It Worked: This handy little contraption saved my life. It was so easy to move the popsicle sticks over once I called on a kiddo, and the lid on the top helped random spills. I'm glad I used numbers instead of names so I can reuse this for years to come! Why It Worked: I think this was my students' favorite reward system of the year. If I "caught them" doing something great, they would choose a random ping pong ball form the jar (in the picture I have eggs because this picture was taken before I bought the ping pong balls). The rewards ranged from "Treat" to "Teacher's Chair" to "iPad Dibs." They loved the surprise, and I loved how quick it reinforced their behavior! Why It Didn't Work: I think this got to be too confusing for my students. They were already earning a puzzle piece at the end of the day if the did not lose more than three letters from our "NOISE" sign, so this reward system kind of fell apart quickly. 5th graders aren't as excited as younger kids to receive class compliments anyway, and we abandoned this around October. Why It Worked: This worked in a similar way to the "Caught Ya" jar, where I would reward a smart thinker with a "Kiss You Brain" Hershey Kiss. My kids loved this quick treat for thinking on their feet or applying their learning in a new way! My parents loved this so much too that they supplied the kisses all year! Why It Worked: I had a pretty good feeling that this would work as well as it did in the middle school setting, and I was right. I loved that asking to go to the bathroom or get a drink wasn't distracting, and this really came in handy when I was working in small groups. I could see a hand raised with the number "1" and could nod yes or no to the kiddo. This is a LIFESAVER! Seriously, if you are not using hand signals in your classroom, at ANY age, you should try it out! Why It Worked: Our class mascot, Rex, really was a hit from the beginning of the school year. I would choose a student who exhibited one of the seven habits to keep Rex at their seat for a day. Then, that student would choose another student the following day. It was a great way to build classroom community and I used Rex for pictures around our classroom, announcements, our class website, etc. Why It Worked: This was another idea from the middle school, and I'm planning on expanding on this idea next year even more. When my students earn an "A" on a test/quiz/lab, I write, "WOOT" on their paper. Then, they get to sign the Woot Wall with a sharpie. It's a fun, easy way to recognize academic achievement, and kids love seeing their name on the wall. Why It Didn't Work: UGH, I will never do this again! It became such a hassle and source of argument for my students to share supplies. Plus, it took FOREVER to replenish the supplies, find missing markers/glue/scissors, etc. It was much easier for my older students to keep their own supplies in their desks so that they could be retrieved quickly. I did use the caddies to keep certain supplies that we used almost everyday however, like dry erase markers and erasers. What ideas are you ditching next year? What ideas are you keeping? Today I'm linking up with The Applicious Teacher for her summer-long linky party! This week's topic: classroom management! I've always found classroom management to be one of my strengths as a teacher. I focus mostly on positive reinforcement and spending LOTS of time establishing routines and procedures at the beginning of the year. With me switching to elementary next year, I'm going to have even more procedures to establish with my little kiddos! I know that my new school focuses on PBS (Positive Behavior Support) so I plan on using that in my management plan as well. Anyone have any experience with PBS who would be willing to give me some pointers? I still plan on incorporating my one major class rule that I used last year: work hard and be nice to people. I also still plan on giving out SNAPS awards on Fridays and using my No Homework Binder. I already made my "Caught Ya" fishbowl to incorporate new rewards in my classroom. I plan on writing different random rewards like sitting in the teacher's chair, swapping seats, etc. on ping pong balls and allowing students to draw a ball when I catch them doing something awesome! 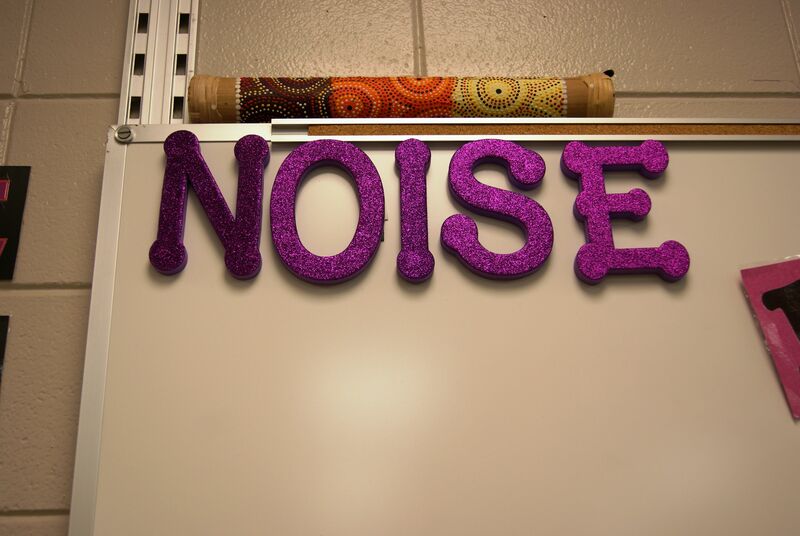 I still need to buy these foam letters from Michaels to incorporate this activity. I love the idea of silently taking away a letter if the noise level is too loud. 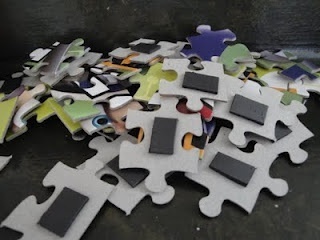 I've seen lots of compliment chains on Pinterest, but I like the idea of adding a puzzle piece to a magnetic puzzle every time my class earns a compliment or works hard as a group! When the puzzle is finished, they earn a reward! I also like the idea of using Think Sheets to document how the students feels about their behaviors. On a random note, we put up our new curtains this weekend! Look how pretty they are! Be sure to link up and share your ideas about classroom management!